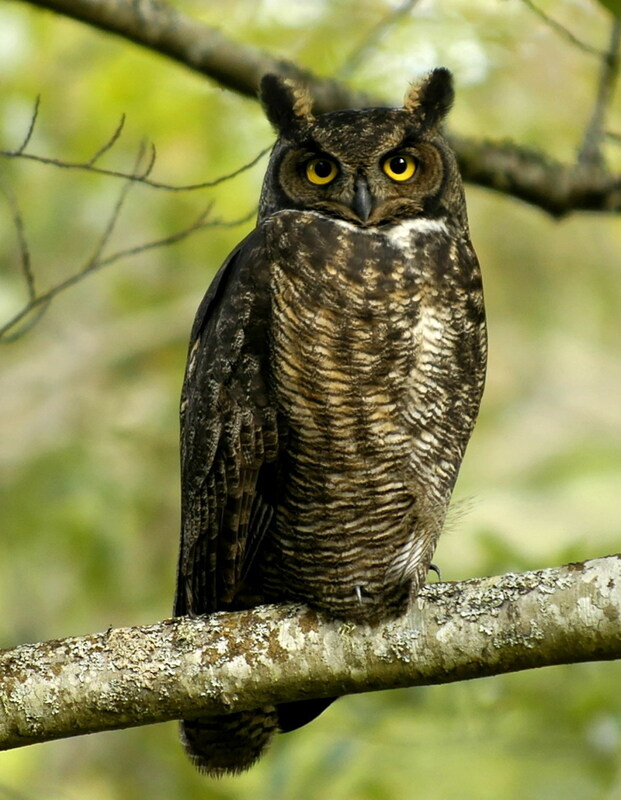 When you think about it, where do birds migrate to and from? The tropics. And what do they eat while they spend the wintertime in that lush warm paradise? Tropical fruit! 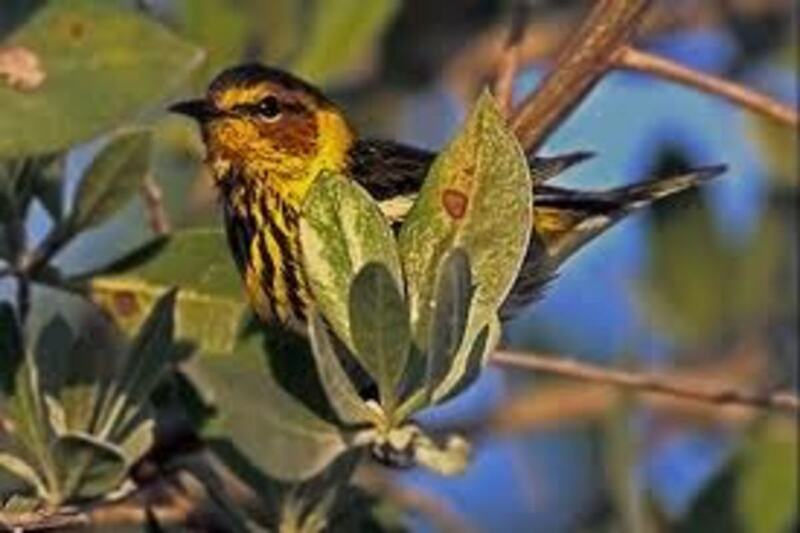 It makes perfect sense then that adding tropical fruit bits to your platform or fruit feeders will catch the eye of migratory birds. The next time you buy a fresh pineapple, how about setting out a small morsel; or try a tiny bit of ripe banana, mango or papaya just for fun. Be persistent--if you don't get any takers the first time, just keep trying with different types of fruit. 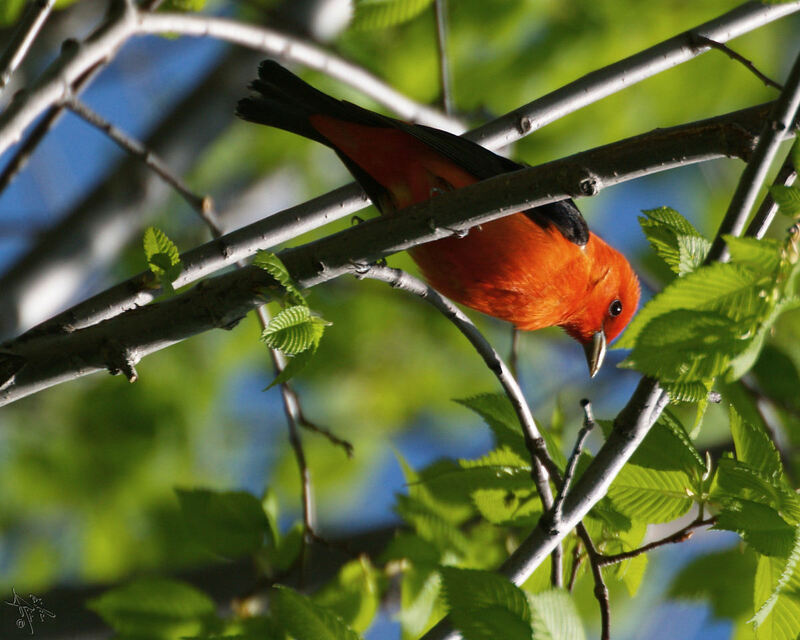 Chances are you will be surprised by a visit from a bird you've never been able to attract to your feeders before. 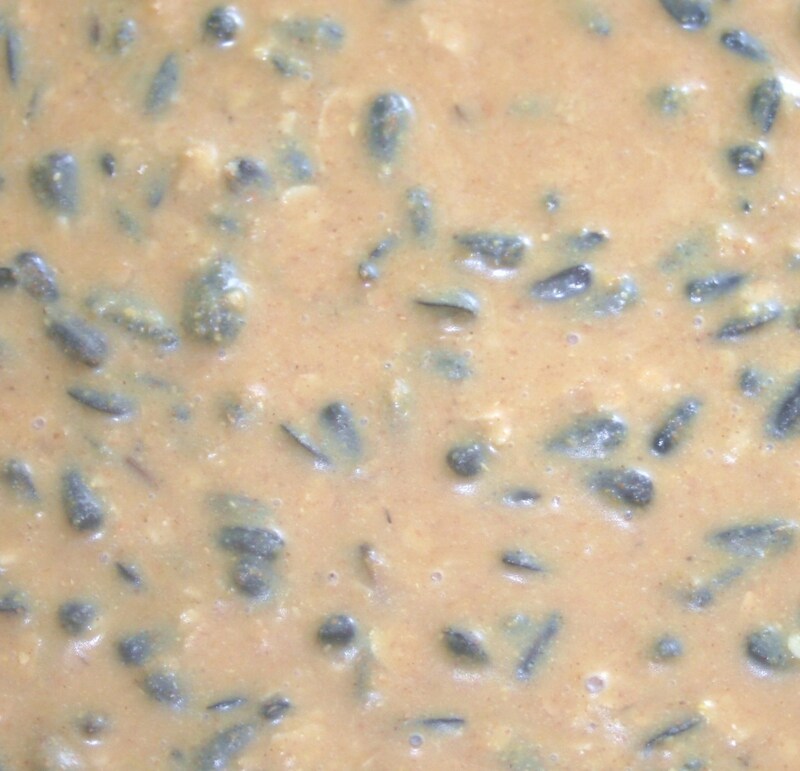 Remove skin and pits or stones and any large seeds such as those found in grapefruits. Cut larger fruits into small pieces about 1/2 to 1 inch in size; pretend you are a bird and you have only a beak and your feet with which to manipulate your food. Juicy fruits like pineapple, grapes and berries can be placed in a small shallow dish. 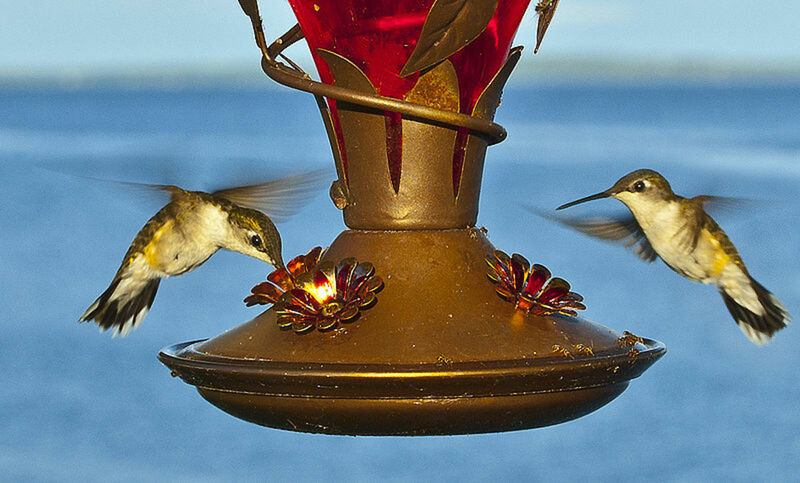 Remember to select a dish that will not tip over or spill when birds land on the rim. Fruits like apples and figs that have more solid textures can be added to platform feeders. 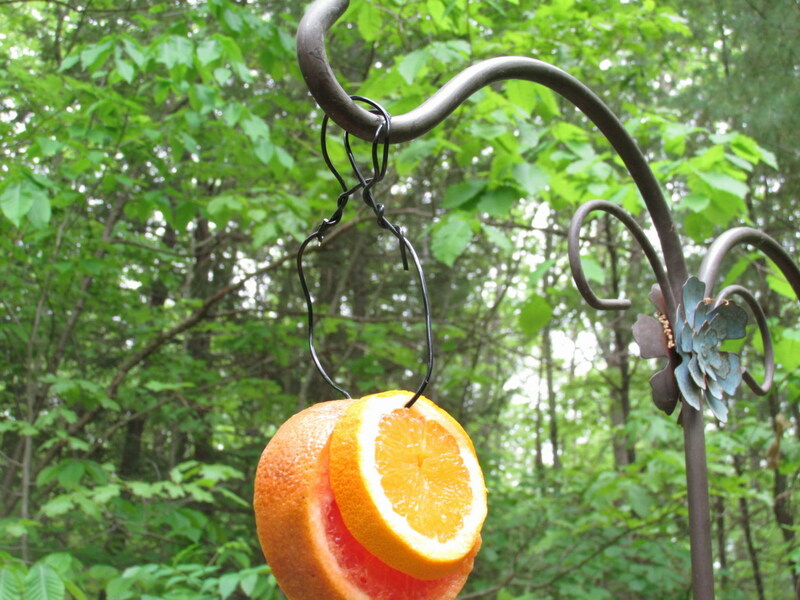 If you are using a fruit feeder with a peg, slice the fruit in half and push it onto the pointed end. I usually insert the point of my paring knife into the end of the fruit that goes over the peg. That makes it easier to add the fruit half without getting squirted with juice! 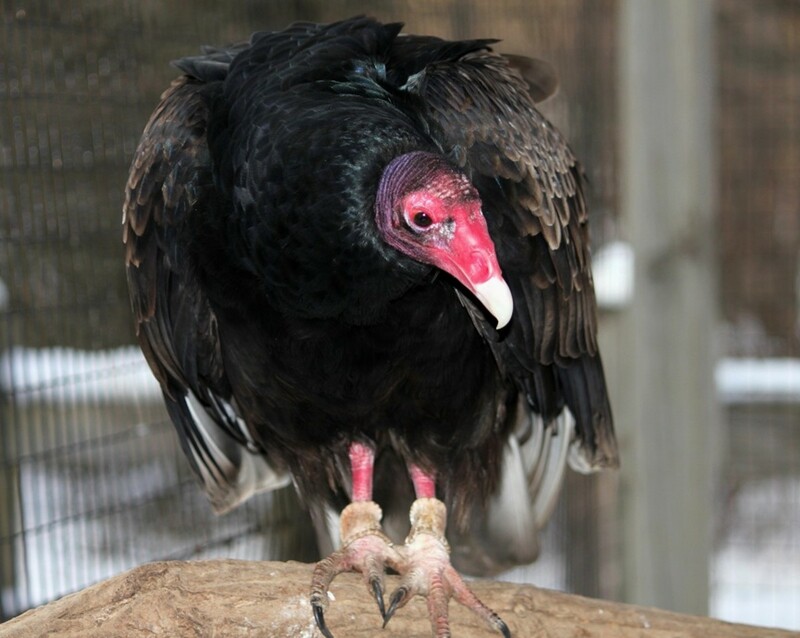 Blemished fruit is okay, but rotten or moldy fruit should be added to your compost, not your bird feeder. Only put out a little at a time because fruit spoils quickly in warm weather. Remove it if it is not consumed during the day to discourage visits from raccoons, etc. 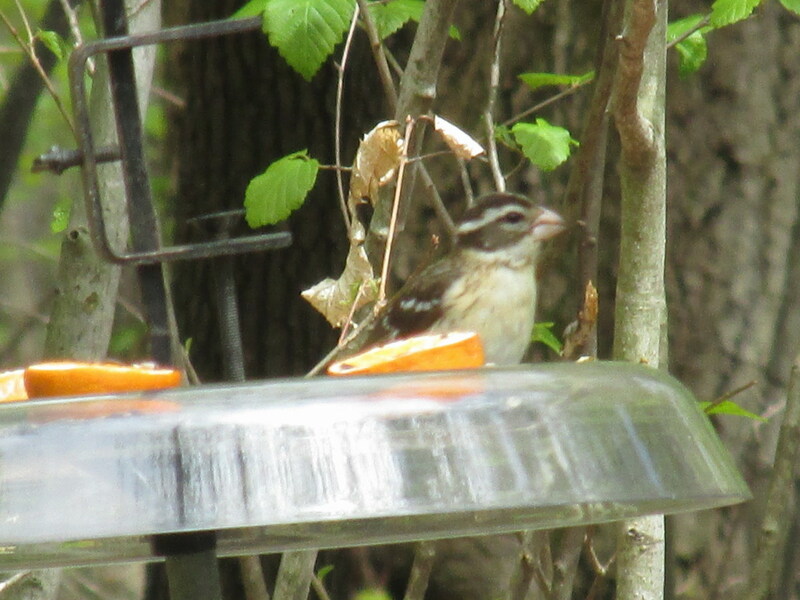 Have fun and experiment to see what birds are attracted to your fruit buffet. 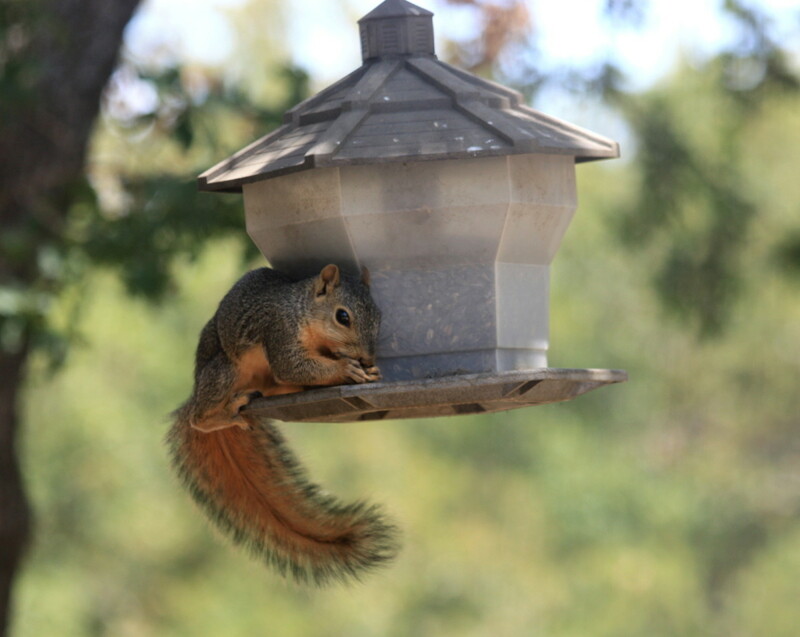 Fruit feeders with built-in holders and cups are available where bird seed and feeders are sold, or online. There are many styles from which to choose. 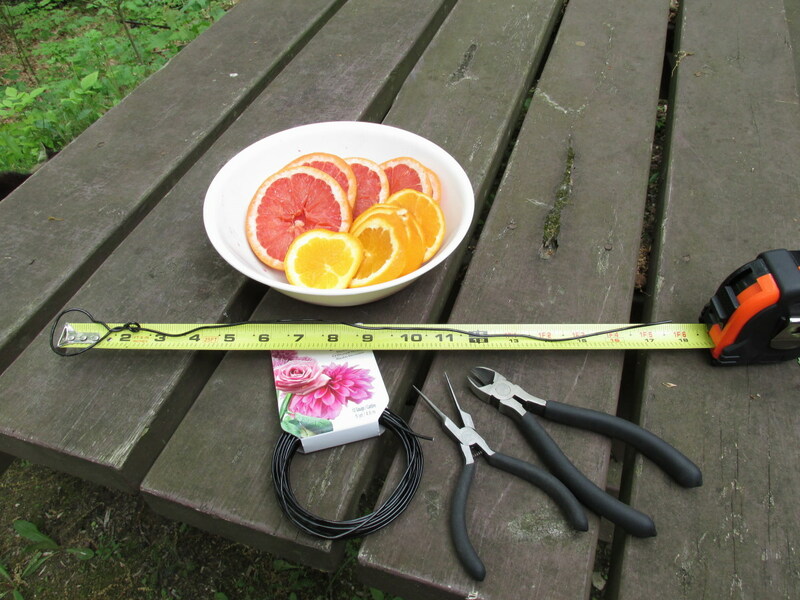 Or you can make your own simple fruit feeder with a wire and a couple of tools you may have in your toolbox. 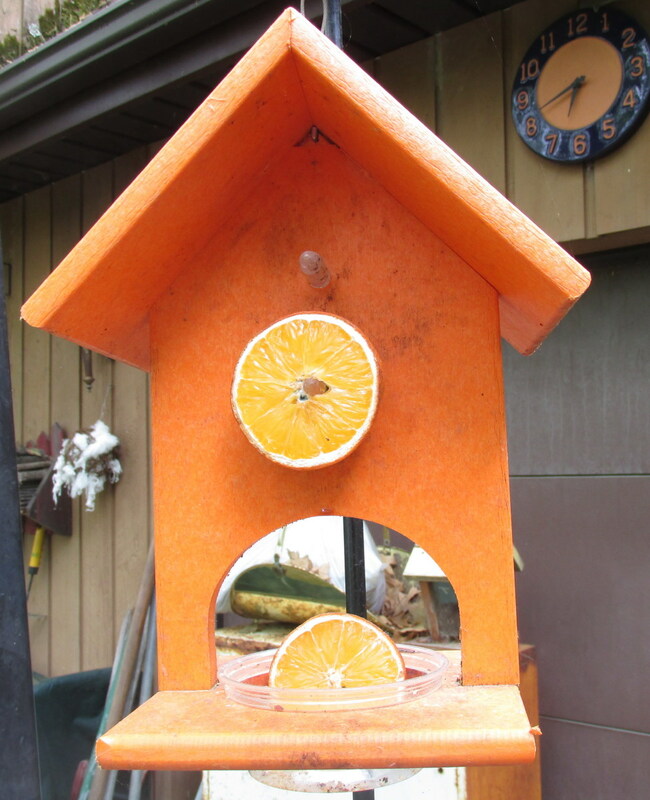 Homemade Fruit Feeder for Birds in 4 Steps! slices of fruit, such as apples, oranges, tangerines, etc. Step One: Measure approximately 20" of wire and snip with wire cutters. Step Two: With the help of the needle nose pliers, form a loop approximately 1" to 1 1-1/2" in diameter and wrap the end around 2 or 3 times to secure the loop. Step Three: Thread 2 or more slices of fruit onto the wire. 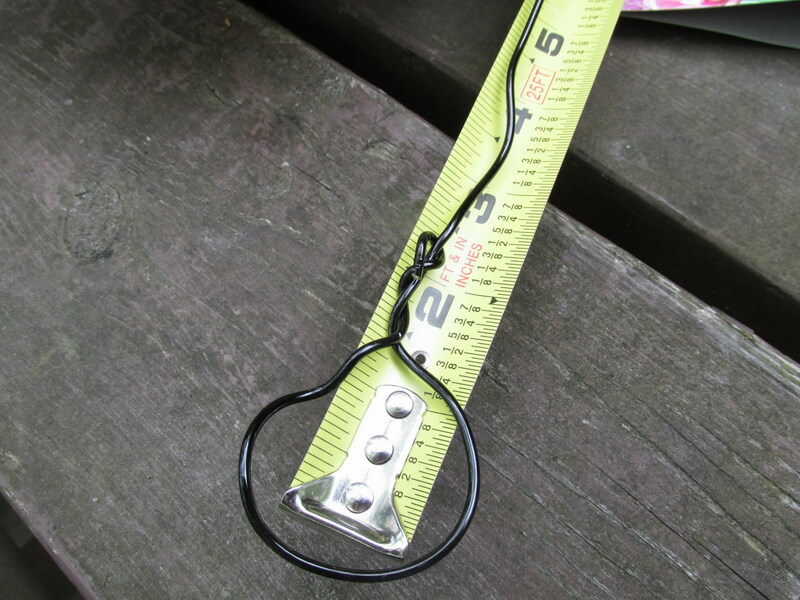 Step Four: Form another loop like the first one and hang both loops over a hook where birds can find it. 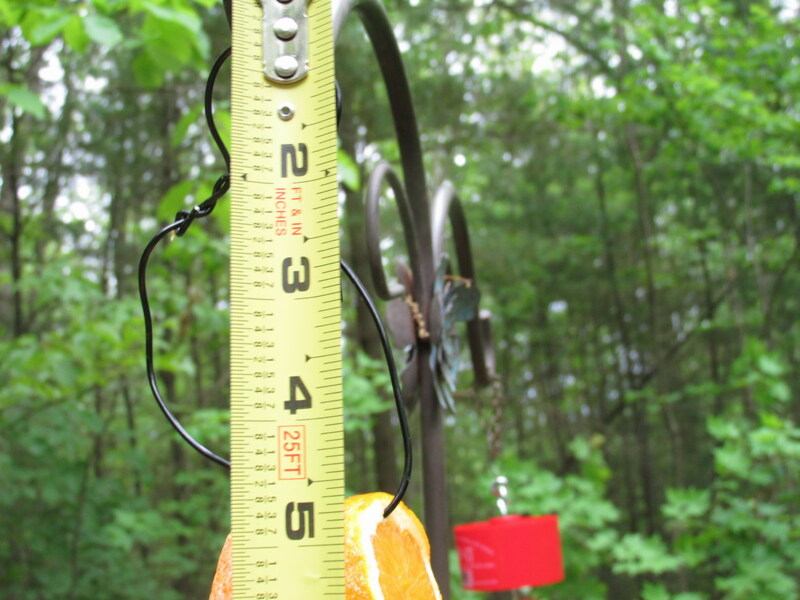 The feeder should hang down no more than 5" in order that birds can reach the fruit slices easily. 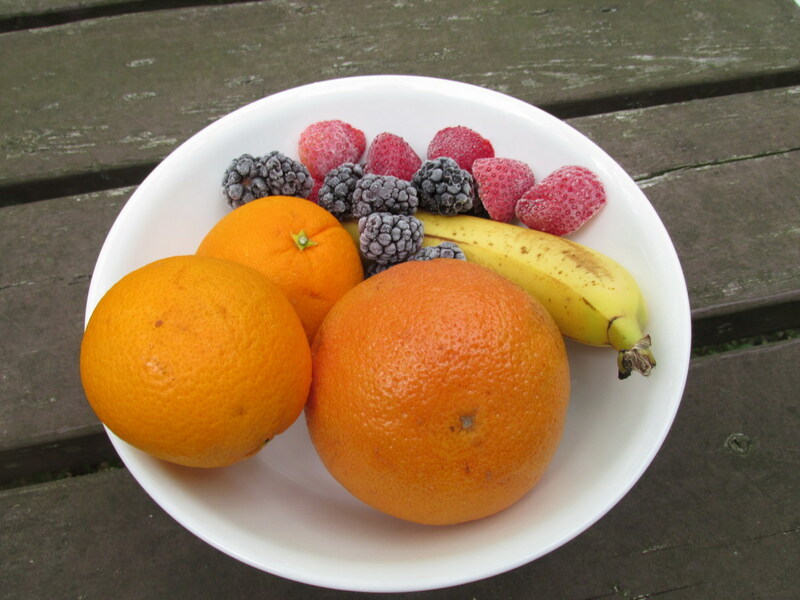 Fruit should be added to your compost pile or discarded after several days, if it hasn't been eaten by then! If the weather is very hot, or the feeder is in the sun all day, check to make sure the fruit has not spoiled or soured. reform the hanging loop and wrap 2 or more times to secure. The 12 gauge wire is sturdy but quite flexible and easy to work with. It's perfect for this project. You could make more than one and offer different fruit slices in different locations. Do You Offer Fruit to Your Birds? Yes, and they love it. No, but I will now, just to see if I get any takers. Nope, fruit is just too expensive! 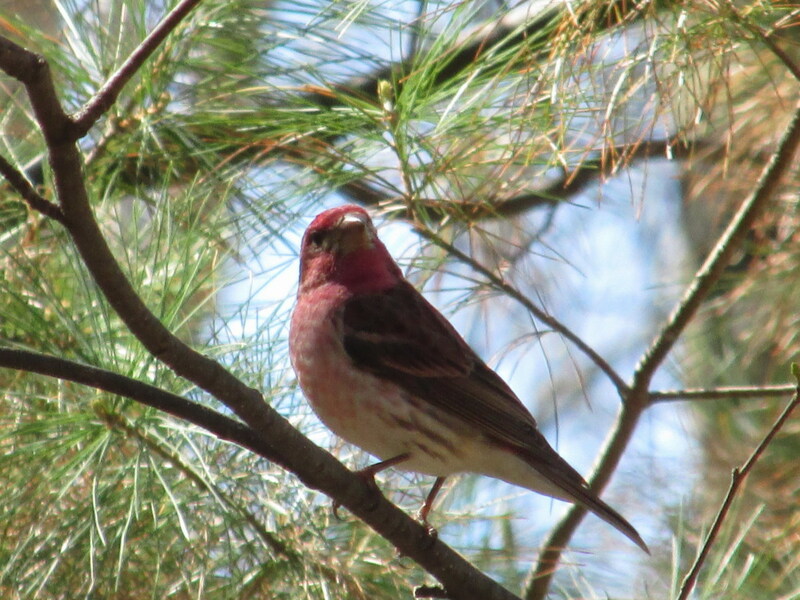 There are so many colorful birds out there. 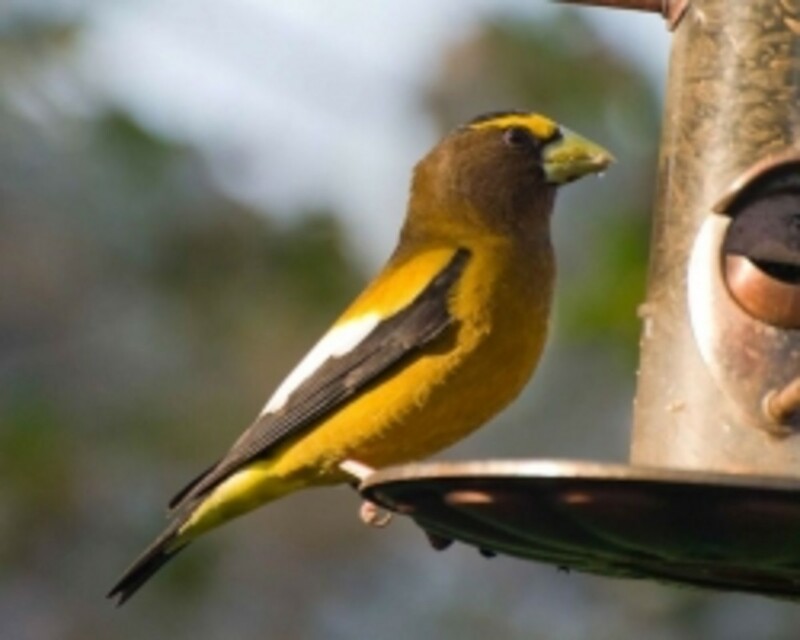 Adding fruit to your feeders is a great way to attract birds you may never have seen before; particularly in spring to early summer time when they are hungry after migrating all those many thousands of miles. It's fun to experiment with different bird treats and treasures. 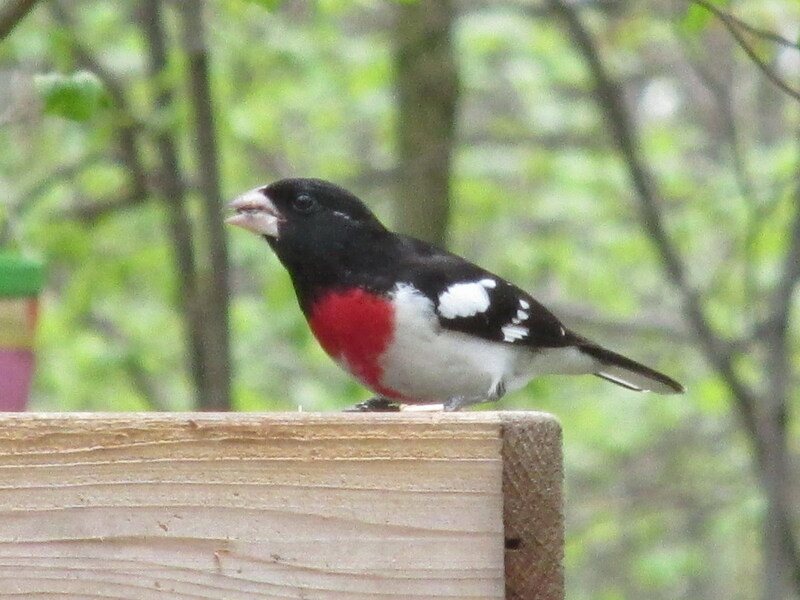 You just never know what beautiful surprise you will find next at your bird feeders! This is so clever. I am bookmarking it so I can give it a try. I love having the birdies come visit. And the thought of having new ones is exciting to me. Thanks Deb! 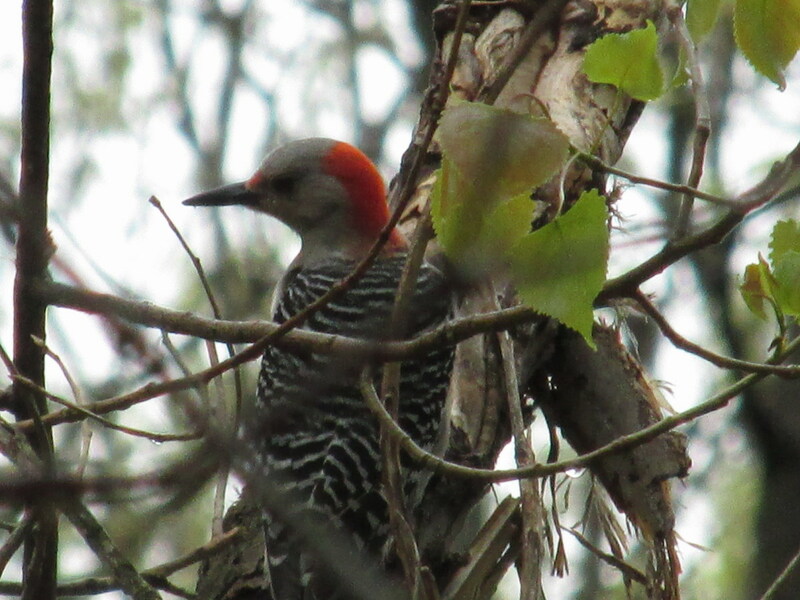 Oh, but you have such wonderful places to look for uncommon birds! 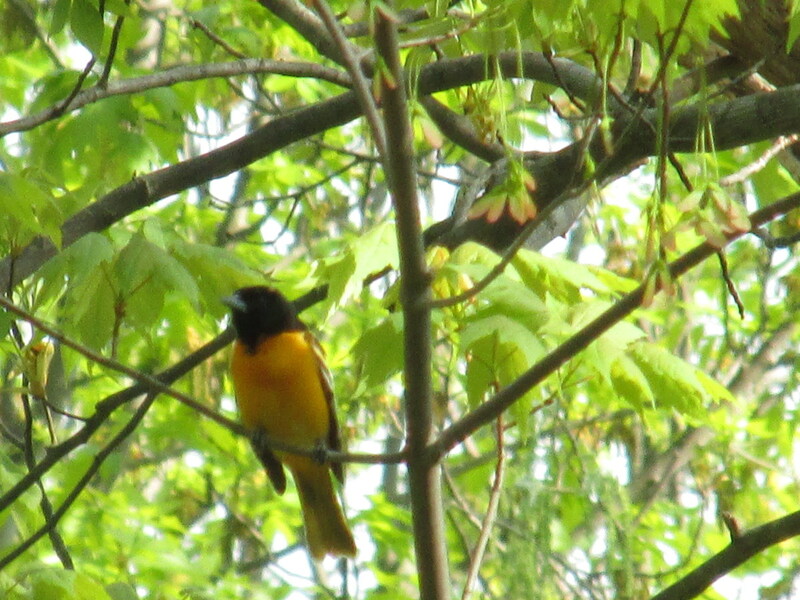 It has taken a few years to attract the more colorful and rarer birds, and I still have more I hope to entice. Yesterday I saw a grackle fly in to steal a few morsels of bird seed. This is the first time I have seen a grackle this far up in the woods. There are plenty of them down in the housing developments on the 'flats'. What a shiny purple/black bird they are! I'd just as soon they didn't start gathering here, though. Good work, Connie! This is such a wonderful way to get many uncommon birds to your homes, instead of looking for them like I do. bravewarrior, I'm so glad to see you! You're on one of the migratory flyways, so it's very possible you might see different birds on their way to northern summer homes. Watch for the ones with luggage :) If you do offer tropical fruits to your birds, please let me know if you had any takers! You're just full of information, Pearl. I never thought of this either. In fact, it never dawned on me that out-of-town guests will stop by for a visit when they're favorite meals are being served. Great hub! Wow, Joe! You really know how to make a person feel like a million! I have to say that I look for your comments because they are always to the point, constructive and supportive as well as inspiring. I love the topic, my friend, but I also appreciate the tight writing, the liberal usage of beautiful images, and the great organization of your hub. Both in content and in presentation, then, you are absolutely stellar! Thanks for sharing! Aloha! How very clever, Pearl! I was reading that first part, about tropical birds eating tropical fruit, and I went.....DUH! Then I slapped my forehead and this huge lightbulb went off overhead.